The Frugal Family Life: *HOT* $10/1 Holmes Air Purifier = ONLY $4.94 at Walmart! 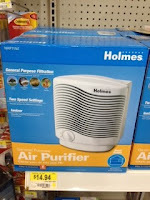 *HOT* $10/1 Holmes Air Purifier = ONLY $4.94 at Walmart! Wow! There's a new coupon that just popped up for $10 off ANY Holmes or Bionaire aer1 Ready Air Purifier! It's being reported that some Walmarts have the Holmes Air Purifiers priced at only $14.94. That means ONLY $4.94 after coupon! !